A carer who tried to murder a 90-year-old widow by bludgeoning her over the head and stabbing her in the neck in an attempt to steal £31,000 savings has been jailed for 21 years today. 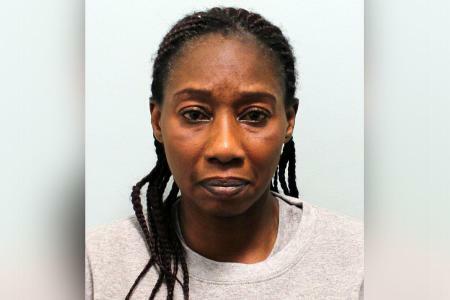 Abosede Adeyinka, 52, from Nigeria burst into Pam Batten’s home, knocking her to the ground before striking her twice with a hammer she had hidden in her handbag. “As far as you were concerned, once she had identified you, she had to die”, he said. “You have shown not one iota of remorse. You planned a burglary with gloves, a mask and a hammer, it was for gain, and your victim was especially vulnerable. 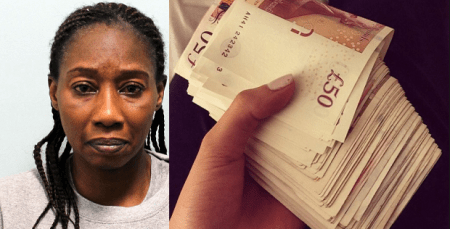 The court heard Adeyinka, an agency carer for Avant Healthcare Services, ambushed the pensioner when she was home alone on the evening of April 27 this year. Knowing Mrs Batten’s husband had “squirrelled” away cash around the semi-detached home, she planned to burglar the house and, believing the pensioner was out she went to get a key which she knew was hidden round the side. When Mrs Batten opened the door and called out her name, Adeyinka barged through the front door and knocked Mrs Batten to the floor. She pulled a hammer from her handbag and hit the widow at least twice over the head as she lay defenceless on the ground. She grabbed Mrs Batten’s handbag, as the pensioner pleaded with her: “Please don’t hit me”. Prosecutor Kevin Barry said Adeyinka then grabbed a kitchen knife and threw it “like a dart at the victim’s throat”, leaving it embedded in her neck. “The defendant was aware of the cash in the house, and went there on the day in question to steal that money,” said Mr Barry. In a victim impact statement, Mrs Batten said she is now “nervous at night” and “scared someone is going to come to the door”. “Before the attack, she felt lonely because her husband had died, but not afraid like she is now”, said Mr Barry. “Mrs Batten now regularly uses a Zimmer frame to walk because she is unsteady on her feet and frightened to walk without it. “The hammer blows affected her vision in her right eye, and Mrs Batten said she has changed after the attack. “Before, she was the sort of person who was friends with everyone but now she is frightened if someone speaks to her. Tyrone Silcott, mitigating, said the evidence suggests Adeyinka did not go to the house intent on murdering Mrs Batten. “At some point, she was recognised, and it appears that was the spur for an impulsive attack, seeking or attempting to kill Mrs Batten”, he said. He said Adeyinka had worked two jobs to support her three children, spent years volunteering for charity, and worked as a Sunday school teacher at her church. Adeyinka, from Hayes, west London denied attempted murder at trial but was convicted by a jury. The judge also imposed an indefinite restraining order on Adeyinka contacting Mrs Batten and her family or going to her home.